The term megadiverse kintras refers tae ony one of a group of naitions that harbor the majoreety of Earth's species and heich nummers of endemic species. Conservation Internaitional identifeed 17 megadiverse kintras in 1998. Many of them are located in, or partially in, tropical or subtropical regions. Mega diversity means exhibiting great diversity. The main criteria for megadiverse kintras is endemism at the level of species, genera and families. A megadiverse kintra must haeve at least 5,000 species of endemic plants and must border marine ecoseestems. In 2002, Mexico furmed a separate organisation focusing on Like-Minded Megadiverse Kintras, conseesting of kintras rich in biological diversity and associatit tradeetional knowledge. This organisation does nae include all the megadiverse kintras as identifeed by Conservation Internaitional. 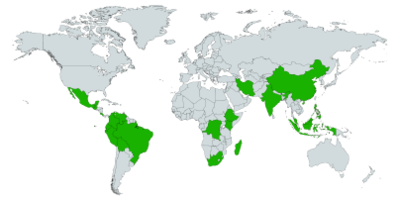 In alphabetical order, the 17 megadiverse kintras are : Australie, Brazil, Cheenae, Colombie, Democratic Republic o the Congo, Ecuador, Indie, Indonesie, Madagascar, Malaysie, Mexico, Papua New Guinea, Peru, Philippines, Sooth Africae, Unitit States and Venezuela. On 18 February 2002, the Meenisters in chairge of the Environment and the Delegates of Brazil, Cheenae, Colombie, Costa Rica, Indie, Indonesie, Kenya, Mexico, Peru, the Philippines, Sooth Africae and Venezuela assemblit in the Mexican ceety of Cancún. These kintras declared tae set up a Group of Like-Mindit Megadiverse Kintras as a mechanism for consultation and cooperation so that their interests and priorities, relatit tae the preservation and sustainable uise of biological diverseety, could be promotit. They awso declarit that they would call on those kintras that haed nae become Pairties tae the Convention on Biological Diversity, the Cartagena Protocol on Biosafety, and the Kyoto Protocol on climate change tae become pairties tae these agreements. At the same time, thay agreed tae meet periodically, at the meenisterial and expert levels, and decidit that upon the conclusion of each annual Meenisterial Meeting, the next rotating host kintra would take on the role of Secretary of the group, tae ensure its continuity, the further development of cooperation amang these kintras, and tae reach the various agreements and objectives. Later, in 2010, Guatemala and Iran were awso included in the leet. ↑ 1.0 1.1 http://www.environment.gov.au/soe/2001/publications/theme-reports/biodiversity/biodiversity01-3.html Megadiversity: The 17 Biodiversity Superstars Archived 2008-12-08 at the Wayback Machine. ↑ "Megadiverse Countries definition- Biodiversity A-Z". ↑ "Biodiversity, Australia State of the Environment Report 2001 (Theme Report): The meaning, significance and implications of biodiversity (Megadiverse countries)". 2014-12-11. Retrieved 2018-07-02. ↑ "UNIDO – United Nations Industrial Development Organization". ↑ CONABIO. "Plataforma de monitoreo de las actividades de implementación de la Estratgeia Nacional sobre Especies Invasoras (Previene) – Biodiversidad Mexicana – Comisión Nacional para el Conocimiento y Uso de la Biodiversidad". ↑ "LIKE MINDED MEGADIVERSE COUNTRIES" (PDF). Retrieved Jul 26, 2018. This page wis last eeditit on 30 November 2018, at 14:21.